Is it Snow? Clouds? I call it "SnowClouds"
Winter Water sand and stone. I call it " Rippling Gold"
I have long known that water is important to me. I am fascinated by the change of seasons and water and how it affects everything in my life. I depend on water. For me, Water represents flow, change, clarity, thirst-quenching…. In Winter, I am surrounded by Winter Water in the form of snow. In Spring the Winter Water melts and flows. In Summer it rains and dries up and then rains once again. Fall downpours take down the leaves from the trees and helps begin the cycle of re-cycling, keeping leaves wet to disintegrate, renew, nurture. I love the seasons, nature, and the lessons I learn as a human bean, still growing and just simply being. As part of a challenge created by a fellow blogger, Marge, I have decided to post some of my very favorite photos. The challenge is called “No Comfort Zone 2012” and you can read more here. The challenge is to step out of our comfort zones once a week and write about it. I am not sure I really have any comfort zones, so this challenge may mean finding one to step out of. Saying this is one of my favorite phptographs is stepping out of my comfort zone. It is so simple and minimalist, uncomplicated, crisp, clean, yet sensuous. It could seem cold to some, yet the curve adds softness, warmth. I like that. It also reminds me of the hipbone of a lover and that’s okay, too. And so is this ~ even talking about my comfort zones is uncomfortable. I am more comfortable in Nature than with people. I am more comfortable in Nature with people than at at party or bar. I find Nature calm, beautiful, simple and in it I find Simple Beauty. Sometimes stark to others, yet the balance and rhythms of Nature suit me. Snow fascinates me. Wind fascinates me. Color shape and line entrance me. Change fascinates me. Shifting winds and weather fascinate me. People also fascinate me. Yet, in large and noisey groups of people I can be very shy. To counteract shyness, I can also become loud and obnoxious. I don’t drink alcohol much or often because I am am not fond of the person I become while drinking… more shy or more obnoxious. Others can drink vast quanties of alcohol and not care what they say or do. My small physical size may have something to do with it… one beer or glass of wine and I can become really stupified or sleepy or flirtatious or any number of behaviors. I can also become all of those without alcohol. I prefer consciousness and conscious awareness for myself. Just my preference for me. Stepping out of my comfort zone – going to a neighborhood New Year’s Eve Party. Some people there may may become falling-down inebriated, which also will be their choice. Others will stop by and say hello, catch up on neighborhood happenings, eat a hot dog, watch the fireworks. I have helped with this neighborhood gathering for several years, including this year. I have attended it, as well. So why is this a challenge for me? This year I am going without judgment, as an observer and participant, to people watch perhaps, to please no one… to just be a participant in ending 2011 and welcoming in 2012 with my neighbors, some of whom I like, some of whom I love, some with whom I have had less than wonderful relationships. See what I mean about judgments? Tonight I may drink one beer and maintain balance. Tonight I may toast the New Year with champagne or sparkling grape juice. I may talk to one person or many. It won’t matter. I will be fine, just being me. So today I will only judge my photographs – not people. It is simple and beautiful and fun. I can control the images I make. I cannot control others. I allow light to shift and dance in my images. I can allow others to shift and dance. I can just be me, shifting, growing, dancing, alive in the company of others – with no judgments and with full awareness of my choices. If this makes sense to you…great! If not, that’s great, too! May your wishes and dreams come true… mine are. Sometimes words are inadequate to describe energy. Lake Superior is pure energy, given in so many ways. Always joyfully giving an abundance of beauty. May your day be filled with beautiful energy! Namaste ~ Star Bear, who is off to start another beautiful day of gratitude for this place and time. Different day, Different mood, always changing, never the same, consistently. Maybe you’ve never heard of Lake Superior, maybe you have never been there. Have you heard the song “The Wreck of the Edmund Fitzgerald”? The video will show you another of Superior’s ever changing moods. Gitcheegama, as the Ojibwe call it, is the largest fresh water lake on the planet. It contains 10% of ALL of the world’s fresh water – in this one place! Its coastline is 1,826 miles long and is shared by the states of Minnesota, Wisconsin, and Michigan and the Canadian Province of Ontario. It is old, very old, and the rocks and stones that line its fabulous beaches, even older. Lake Superior is breathtakingly beautiful and because of its depth, the lake is also breathtakingly cold! The first time I waded into Lake Superior, it literally took my breath away. Late one August, when the lake was at its warmest, following a whole summer of heating, I naively stepped into its crystal clear water, just up to my knees. After about 1 minute, every bone in my legs ached, my teeth hurt, my body tightened, and I quickly retreated to the warmth of the sand. That was in the late 1960’s. Today, the Lake becomes so warm in mid-summer, near the edges, at least, that one can wade fairly comfortably. In 2007, the Lake level dropped 18 inches. Shipping was greatly affected. Ships using the Great Lakes had to reduce their loads in order to make passage through much shallower channels. The cost of running the ships with smaller loads remained constant, affecting the prices paid for things you may use, wherever you are in the world. What happens on, in and around Lake Superior affects everyone. We are all connected… water knows no boundaries. It is the rain, the rivers, the streams, in the clouds and it is always moving, even when it seems frozen. In 2010, some friends walked the entire circumference of Lake Superior. Retired naturalists Mike Link and Kate Crowley hiked 1500+ miles around the shore. They spent four and a half months walking, camping and through the miraculous wonders of technology, documenting their adventure. You can see more of the moods and wonders of Lake Superior through their lenses here: Full Circle Superior. I was honored to walk a few miles with them on this adventure. Sometime today, or this week, when you take that sip of refreshing water, bottled or from your tap, please make a toast to celebrate Lake Superior. You are probably drinking a drop or at least a molecule of Lake Superior water. Namaste ~ Star Bear, who lives near the Big Lake and loves it! Peacocks tail arrayed above and below. Ahh… Can life be better than this? It was Theresa who introduced me to the beauty of one of my favorite beaches and on one perfect fall day I was able to capture this reflective image of her – dancing along the edge of a tide pool looking for agates. She had a beautiful voice and loved to sing, so sometimes we sang on our drives and to the Lake. I created this as a greeting card for her, and she loved writing notes in them to her old friends, telling them about our adventures. When I asked her permission to use this image for one my first Lake Superior Images she was excited and honored that I named it “Theresa Reflects”. I was honored that she gave her permission. I kept her supplied with “her” cards and often told her it was all her fault. It was her fault that I began my ongoing series of beach images and spirit art. 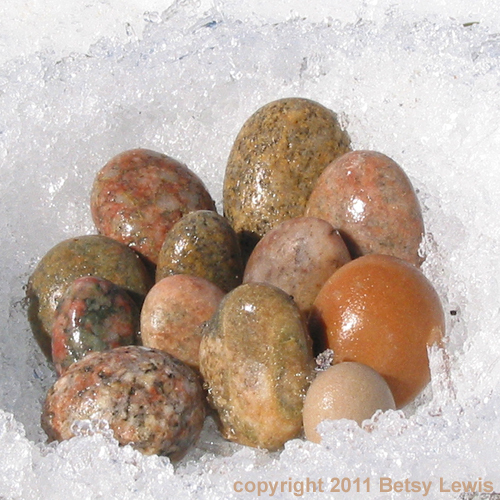 It was because of Theresa I began collecting and working with rocks… It was an ongoing joke between us. When I saw her last summer and asked if she wanted to go to the beach, she was unable to go. Yesterday, I learned from her daughter that she left us on Mother’s Day. Knowing Theresa, it was her choice of days. She was a devoted Mom and I loved her as one of the inspiring women in my life. We shared a love of the outdoors, agates, and Lake Superior. Thank you Theresa, for being a bright spirit and for sharing so richly with me. You are always with me at the beach and continue to inspire my work. Thank you for your reflections of love. Thank you for your laughter and songs. Thank you for being, wherever you are, singing, dancing, laughing, and being cantankerous! LOL! Thank you for being a good friend. Driving back and forth to work is taking longer these days, with camera handy. This sharp shinned hawk is hanging out in the same place, must be good hunting. The Sandhills are nesting too! This pair has been returning to this location for about three years now, and announce their presence quite vocally. I’ve been seeing him/her everyday on the way home. Their call is a loud and distinct squwak with a loud trill. Unmistakable! You can hear it here. The flickers are back as well ~ good medicine. May your day be filled with hawk-eye vision and squawking if you please!